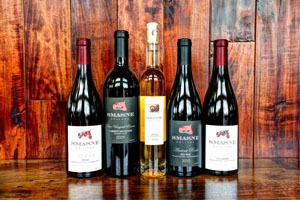 Smasne Cellars was a big winner at the 2013 Seattle Wine Awards! DOUBLE GOLD 2010 Smasne Cellars Blk #3 Syrah, Lawrence Vyd. DOUBLE GOLD 2010 Smasne Cellars Mourvedre, Upland Vyd. GOLD 2012 Smasne Cellars Rosella Rosé, Coyote Canyon Vyd. GOLD 2010 Smasne Cellars Francis, Upland Vyd. GOLD 2011 Smasne Cellars Aligote, Upland Vyd. GOLD 2009 Smasne Cellars Malbec, Phinny Hill Vyd. SILVER 2010 Smasne Cellars Tempranillo, Upland Vyd. BRONZE 2009 Smasne Cellars Carmenere, Phinny Hill Vyd. BRONZE 2009 Smasne Cellars Petit Verdot, Phinny Hill Vyd.